Counter Note: Early in March 2001, at roughly 2900 hits, Tripod took this site offline by mistake. After it went back online, Rarefiles excluded the counter. In mid August 2001, another counter was installed and set to 3000 hits. So, the present count is definitely an undercount. Both Biff and myself (Falconer) have been DOOMed almost since Doom's inception. 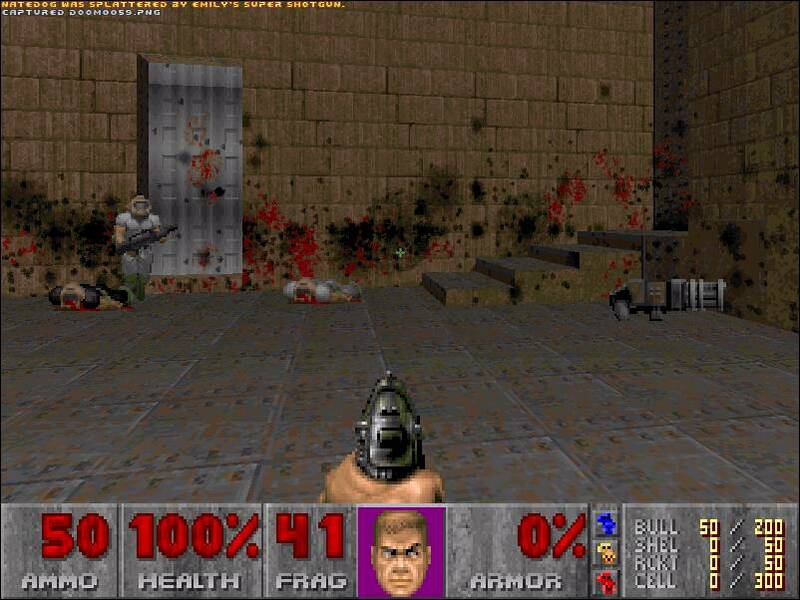 I first played Doom as a demo. Later, I picked up the full reg and got online with DWANGO (see FAQs for more DWANGO info). Not long after, Biff logged on, and we have been friends since. Eventually, I became a DWANGO moderator. I later resigned since there were too few players and too much college level homework. When ZDoom was introduced, both Biff and I took to the 'net with DoomServ. Eventually, Biff moderated on DoomServ, until TGO dumped all his moderators. On this site, we focus on Internet head-to-head play. 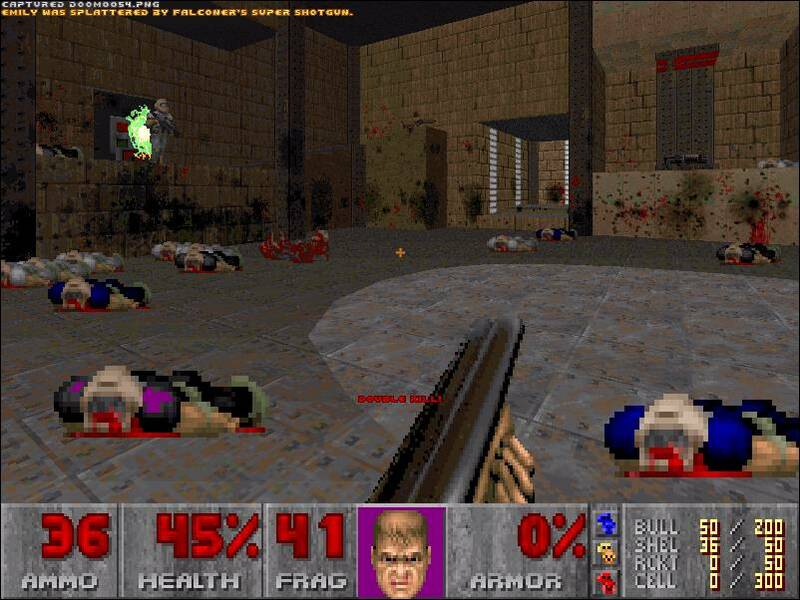 Biff and I have joined the ranks of those who keep alive the earliest smash-hit of the first person shooters, Doom. 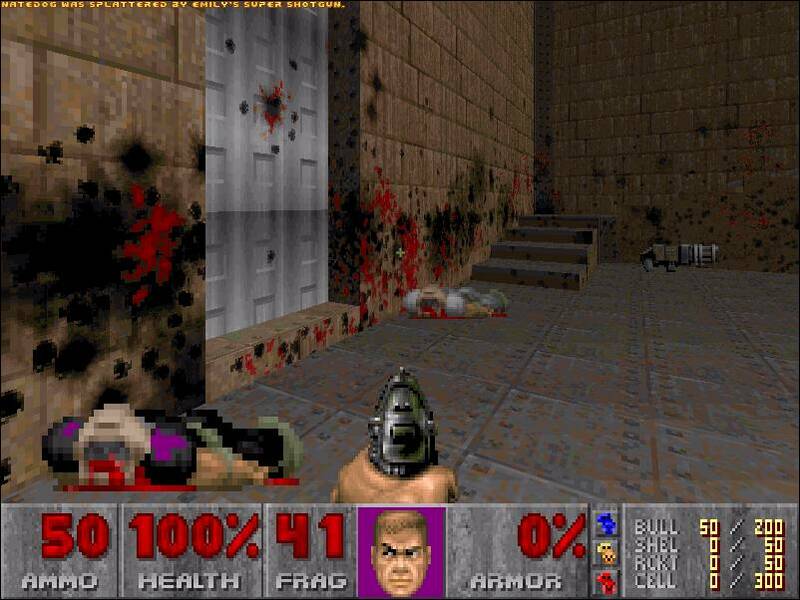 While we engage in other games, we continue the Doom tradition. We just like it. And, for us, there are a lot of memories tied to those early nostalgic days of Doom's rise to fame. Don't hesitate to send us E-mail, and we hope you enjoy the site and our game server. Biff recently hosted a LAN Party for some of our buds. The screenshots above are from DCDWANGO map 9, and are an example of the new ZDoom 2.0 alpha. I don't know when it will be released, ask Biff about that, he's somewhat tight with Randy Heit. Games played included Doom2 (of course), Quake3 Rocket Arena, Unreal Tournament, and some over the 'net Counter-Strike. This LAN was an over-nighter. Peeps began to leave 3 PM the next day. Biff plugged his LinkSys router into the 16-port switch we all were on, which made LAN configuration a snap. The router has a DHCP server in it. We all setup for DHCP and it automatically assigned our IPs and gave us Internet access, so we could read our mail, and check ICQ too. Special thanks to Biff for hosting this LAN. The pop-up (that you probably just closed) launches a Real Audio music file. The selection changes often (with my mood), so ya'll come back now, ya hear. RareFiles uses counters, chat rooms, and discussion boards on BraveNet. However, they went down recently, and our links to their counters made our site hang and timeout All their counters on this site have been disabled. Rarefiles hangs no more. Sorry for the inconvenience. When BraveNet returns in its full glory, our counters, chat, and discussions will too. RareFiles has added a chat room. This is handy if you want to chat with someone who doesn't use the same instant messaging program you do. Also handy for those that like to chat first before jumping from one server to another. Put a link to this room on your desktop. Rarefiles has added a discussion forum. You can discuss anything related to Doom, but principally, we'd like to hear about how we can improve your Rarefiles experience (read: comments about maps you like and hate). For the holidays, Biff has released his new DM-MORPH WAD, complete with railgun. This is a conversion of the DM-Morpheus map of Unreal Tournament. Download today! 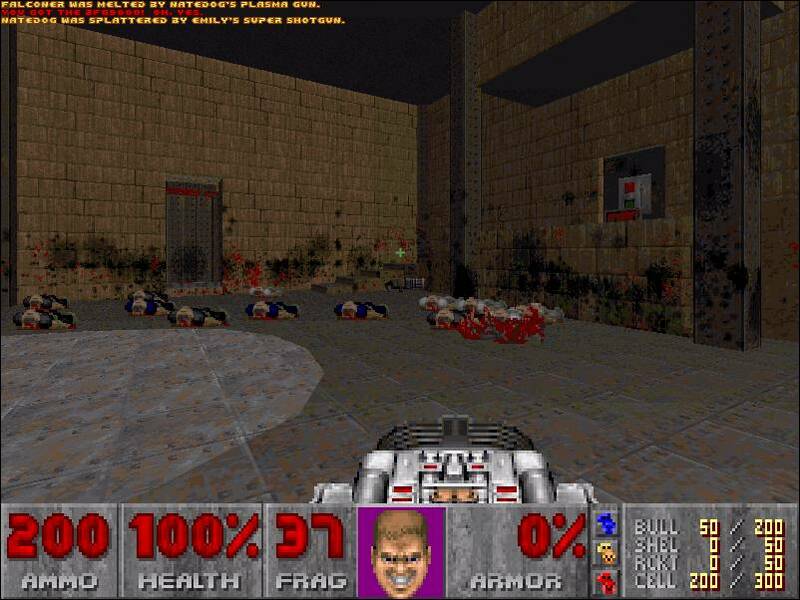 PLEASE NOTE: It will not run from CSDOOM or ZDAEMON, but you can load it with ZDOOM 1.23 and connect with other users via console command line. The Links page has been updated with some new content, and to repair broken links. September 11, 2001 - Another Day Which Will Live in Infamy! ". . . a date which will live in infamy . . ."
September 11, 2001 is another such date, but the enemy is masked and of uncertain identity. We ask that you join us in prayer for our fallen citizens, whose loss we all mourn, for their families and friends, and for those engaged in the rescue and clean-up operations. 3 If ye walk in my statutes, and keep my commandments, and do them; . . .